Pet Care Dog Kennels Created by kleverthemes. This templates have specific characteristics, namely: Pet has features such as High Resolution: Yes, Layered: Yes, Minimum Adobe CS Version: CS . 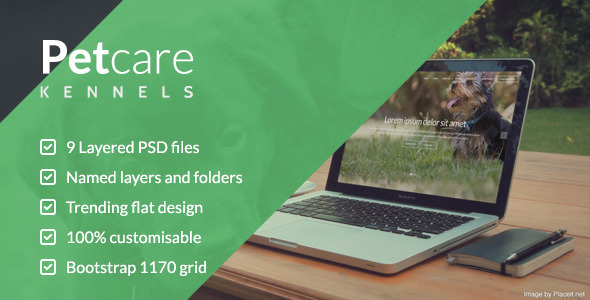 You can use this Pet Care Dog Kennels on Psd templates category for animal, animal services, boarding, cats, dog walker, dogs, hotel, kennel, overnight, pet care, pets, vet and another uses. PetCare Kennels is an elegant, minimal design aimed at dog boarding kennels and the pet services industries. The design is base upon the bootstrap 1170px width and comes with guides & gutters.